Which came first? For most of us city folks, it’s the eggs. Every week, I get a FreshDirect delivery of a dozen perfect ovals nestled in a cozy cardboard box. At breakfast time, while I wait for the pan to heat up, I sometimes read the package for my Nature’s Yoke Pastured Eggs, which describes family farms, fresh air and happy hens. I buy pastured eggs for their rich yellow yolks and firm shells, but if you’re anything like me, you might also wonder how much of the package promises are true and how much is exaggeration. 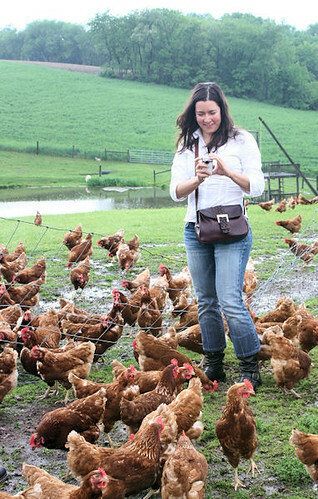 I was thrilled to have the opportunity to travel with a small FreshDirect team to visit Westfield Egg Farms, the producers of Nature’s Yoke eggs….